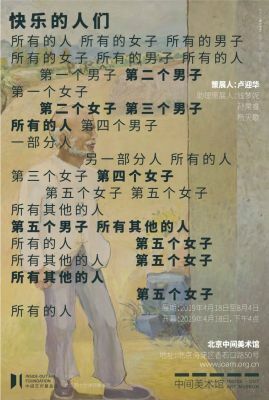 The 152-character exhibition title comes from the poetic drama, Happy People, written by the poet and literary critic He Qifang (1912-1977) on November 20, 1940, later published in his second collection of poems, The Night Song. In 1938, the poet arrived in Yan’an, the basis for the Chinese Communist Party from 1935 to 1947. Moved by the atmosphere of freedom, engagement and happiness, he wrote a series of poems to “sing for the morning, sing for hope, sing for those who belong to the future, and sing for the growing power.” The poet’s optimistic feelings about the unfolding of a new life run through all the poems in The Night Song. Happy People depicts a utopian scene in an autumn night where a group of young people gather in the wild and talk about their ideals while singing and dancing around a bonfire. There are many figures in the poem, some appear as collectives, such as all people, all women, all men; some as individuals, such as the first man, the second woman, the fifth woman, etc. They/he/she all take on a non-distinctive identity but strong traits and personal experiences, with each representing a certain type of individual. Through their personal or collective remarks, the poem condemns the old regime, anticipates a new life, celebrates the new order of democracy and peace, and expresses a yearning for a passionate collective life. The poet sincerely expresses himself, after his world view and feelings change with his rediscoveries about himself as well as the life. Since China entering the so-called “New Era”, the new historical conditions have brought about dramatic changes and intense feelings for each of us. We observe and absorb such changes on both personal and collective levels, and there is always an impulse to speak out. Whether one chooses to live beyond or within the mundane world, whether one gets away or stays on, whether one keeps silent or just mutters, they are all individual iterations of one’s relationship with the present. Or in other words, we need to explore certain appropriate expressions in adapting to the New Era: communication via poetry. In He Qifang’s poetry and imagery, we have found a way to convey today’s ideas and emotions. In his poetry, he puts much emphasis on the perfection of the forms of poetry writing, the strictness of rhythm and the richness of feeling. We have taken away the monologues and dialogues in the original poem, Happy People, only retaining the references to the characters, the outline and shape of the poem. In the exhibition, the artists narrate the stories through their artworks, which replace the verses that have been omitted from He’s poetry. The original poem unfolds the plot through the dialogues and monologues of the characters, and presents figures of different characteristics with rich emotions and inspirational thoughts. By only referring to the varied characters in the poem as signifiers, we hope to open a vast space for ourselves and the audience to think further about the actual content to be voiced. As signifiers, the individual characters exist in both singular and plural forms; similarly, those groups of characters are both plural and singular ones. The entirety of all individual and collective characters conjures up a group image of “us”. We have also invited Associate Professor Luo Xiaoming from the Department of Cultural Studies at the Shanghai University to write an article in parallel with the exhibition, Inference-World/Instructions, which will be published in the exhibition catalogue.